This April's trip was one of a series, which started in 2014 with a single day on the Upper Texas Coast at the end of the 2014 Colorado-New Mexico trip, followed by 8 days in TX in April 2015. The 2016 trip was slightly tweaked on timing compared to 2015. 2015 had better weather but apparently fewer species for reasons I don't fully understand. I split this trip 0.5+4+2.5 as UTC-RGV-UTC (UTC=Upper Texas Coast; RGV=Lower Rio Grande Valley) using a "bird in the day, fly at night" scenario. I flew down to the RGV from Houston for speed, but it's also possible to anchor the trip in Houston and drive to the Rio Grande Valley. I've spun off most of my Texas site info into TXsites.html. NARBA Texas page has listings of rarities and semi-rarities. One option - more useful if you make at least some eBird reports - is the eBird alert service which lets you set rare bird reports or "needs" reports for specific areas down as far as the county level. I set these up for: Cameron, Hidalgo, Starr, Webb and Zapata Counties for the Rio Grande Valley; Jefferson, Chambers, Harris, Galveston, Brazoria Co for the Upper Texas Coast and also "Rare Bird Alerts" for the entire state. You can set these alerts to hourly as well as daily, so it has the potential to shift itineraries on-the-fly if you're good at monitoring email from the field. Of course injudicious use of hourly needs reports for a county you've not submitted any reports for is going to potentially deluge you with email, so caveat emptor. The "needs reports" list all species reported that you have not included on any previous report for that state or county. On this trip I used these reports, so I also made a lot of eBird reports from the field using the BirdLog app. In 2015 I made a lot of eBird reports. This year only one or two. eBird has damaged email birding list participation and I post very few lists to eBird now. Another option Birdcast forecasts which provides some weather-informed migrant forecasts but also provides links to regional "expected" dates for migrants. Very good for managing expectations. For trip/year listing I've put my BirdsEye app into year list mode which then lets me highlight species near me that I haven't seen yet. On this trip BirdsEye was a little more functional than it had been on other trips. However there's no way to upload a "target" list without messing with your Year or Life list, which is one defect of this app. Not every sighting tends to turn up but it is still useful. Although I favor Southwest (free checked bags, no microscopic planes), they underperformed on this trip: both HOU-HRL and HRL-HOU flights were significantly delayed and 3 of 4 legs on Southwest left late. Baggage claim at HOU is unacceptably chaotic (at HRL and even EWR it was quite fast). I flew American from EWR to IAH via DFW and that went quite well. Delays notwithstanding - and some spectacular intra-staff bickering on one American flight that got the captain involved - myself and my bags got where I needed to go within an hour of when they were supposed to be there. Car rentals from Alamo (IAH to HOU travel day) and Enterprise (HOU and HRL) went well, although they could be better at HRL. One unpleasant surprise was the elimination of options for direct flights from EWR to Houston except for United who were gouging on price for that route, so I changed planes (DFW inbound, STL outbound) which cost me 60-90 minutes in total travel time. I'm wondering if the crash in gasoline/oil prices are having an effect with lower demand, since NYC and Houston are pretty major cities. Day 1 was a travel day, starting with a 5am American Airlines flight from Newark, changing at DFW into IAH, then ending with a Southwest Airlines flight from Houston Hobby to Harlingen. In between I landed at IAH, rented a car from Alamo and did a little bit of high velocity birding around High Island in search of various migrants, for which my total time was 5 hours. Weather was heavy overcast with intermittent showers. A larger storm system had just cleared the coast when I landed. On the road (mainly I-10) it wasn't all that birdy, although the most interesting birds started to accumulate as I traveled south of Winnie: Black-bellied Whistling Duck perched in a dead tree next to the road; Cattle Egret; Great Egret; Belted Kingfisher; Eurasian Collared-Dove; Scissor-tailed Flycatcher on wires near High Island; Tree Swallow flock in wires near Anahuac; Great-tailed Grackle; Eastern Meadowlark. 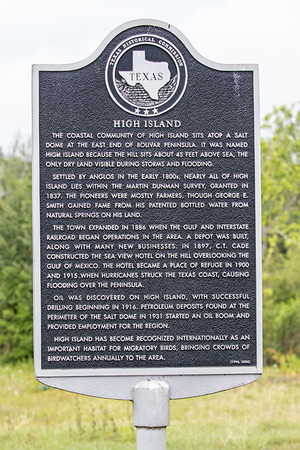 First birding stop was High Island where I pulled out at the historical marker on the north side of town and found some interesting migrants: Blue-gray Gnatcatcher; Common Yellowthroat; several Indigo and one male Painted Buntings; Orchard Oriole; Bobolink. Great Egret, Little Blue Heron, Cormorant sp and Plegadis Ibis sp were flyovers. Along the road at the Boy Scout Woods location were a male Summer Tanager and Baltimore/Orchard Orioles in the trees, Cedar Waxwing flocks, Hummingbird sp. (Ruby-throated), female Hooded Warbler and male American Redstart. I bought a $25 season pass to the High Island sites but lacked the time to explore any further. A pair of Inca Doves flew in as I headed back to the car - the nesting pair along 5th Street. A Swainson's Hawk was circling over the south side of town. Indicative of the "Eastern deciduous" UTC species mix I had Blue Jay. On the road between High Island and Rollover there were many Brown Pelicans over the ocean, Great Egrets and two Blue-winged Teal in roadside pools. At Rollover Pass the tide was extremely high with almost no exposed mud and some road flooding on the coastal road - the sea is trying to destroy this road, and making some progress with it as it has done with the former coastal road north of High Island. Laughing Gulls were obviously abundant, Ring-billed Gulls coming in second but no bigger gulls. The tern flocks were tightly packed and contained good numbers of Least Tern, Black Tern, Royal Tern and Black Skimmer. A few Common Terns and Sandwich Terns rounded out the mix. Shorebirds were more limited: Sanderlings and Ruddy Turnstones, a flock of American Avocets and a couple of Black-necked Stilts, Willet and one Marbled Godwit, the inevitable Killdeer. Neotropic Cormorants were in the cut/pass and a Belted Kingfisher flew by. In the remaining time I made a rapid trip around Anahuac where Boat-tailed Grackle was dominant, Summer Tanager over the road, Indigo Bunting along with it, a fortuitous Least Bittern in flight and one bona fide White-faced Ibis amongst many probables. In contrast to 2015 the fields surrounding Shoveler Pond were not flooded fields - so poor sources for shorebirds - but I did track down my first Solitary Sandpiper in the pond at the Willows. At which point there was just enough time to make it to HOU to return the rental car (slightly muddy). Southwest took off 45 minutes late due to the late arrival of the pilot, so searching for parrots in Brownsville was off the table and I just drove to South Padre Island for the night. It being mid-week in low season the decent Econolodge was very inexpensive. Although not a luxury hotel the Econolodge is perfectly fine and a very good value for money - this hotel is NOW CLOSED (and had picked up a slew of negative reviews in the last year). South Padre Island Convention Center: First birds were one of a whole series of massive Franklin's Gulls flocks, before I even parked the car. Migrant movement was modest: Indigo and Painted Buntings; large icterid flock with Yellow-headed; Kentucky Warbler, Black-throated Green Warbler; Blackburnian Warbler; Prairie Warbler; Northern Parula; several Tennessee Warblers. Warbling and White-eyed Vireos, Summer Tanager, Rose-breasted Grosbeak, Swainson's and Wood Thrushes, Lincoln's/Chipping and Clay-colored Sparrows. The Black-bellied Whistling-Ducks were all over the place and feeding on the lawns right in front of everyone. A small flock of Dickcissels mixed in with the icterids and sparrows. A Nighthawk sp (likely Common) was seen briefly searching for a quiet place to roost Sora and a cooperative Least Bittern. The tide was relatively high but was even higher upon my return later in the day. The modest tern flock contained primarily Royal, Least and Sandwich and a few Caspian Terns with Black Skimmers. Egret/Heroms: Snowy, Great Blue, Tricolored, Reddish Egrets. Shorebirds included Marbled Godwit, Black-necked Stilts, Dunlin, Dowitcher sp, Black-bellied Plover. Leaving South Padre Island, Chihuahan Raven and Swainson's Hawk en route towards Harlingen, with either Whimbrel or Long-billed Curlew over flats near Laguna Vista. Probably Whimbrel since Curlews are scarce by April. I saw this same pair of Chihuahuan Ravens along TX-100 multiple times, and they turned out to be the only ones for the trip. After Frontera I went in search of shorebirds on sod farms. I made a wrong turn down Hackberry Lane instead of Weaver Road and was rewarded by flooded rice fields that had two Hudsonian Godwit, Greater Yellowlegs, Black-necked Stilt, several White-faced Ibis, Cattle Egret and other herons. A nervous flock of smaller sandpipers were probably Pectorals. Weaver Road sod farms themselves didn't have any shorebirds. The small ponds in Rangerville had Pied-billed Grebe and two pairs of Couch's Kingbirds as well as Green Heron and Neotropic Cormorants. Returned along TX-100 toward South Padre Island. Stopped at the well-characterized Aplomado Falcon spot where one was perched on the lower on roadside wires and some very dark Swainson's/White-tailed Hawks were circling in the distance. The white breast patches suggested young White-tailed, but Swainson's are a very variable species in dark morph. The edge of the marsh up the dirt road had Harris's Hawk nearby, Stilt Sandpiper, Dowitchers, Greater Yellowlegs. South Padre Island - the bad news at the Convention Center was that Fri-Sat-Sun were going to be affected by a biker event, with inevitable crowds and noise although some birder access via walk-in or shuttle trolleys. The birds were much the same as the morning, with a few additional bonuses: Worm-eating Warbler, Kentucky Warbler, Sora, Least Bittern. Didn't look like much if any migration was added in the afternoon and things like Clay-colored Sparrow, Dickcissel etc were still around. Finally saw a Marsh Wren. The Valley Land Fund lots along Sheepshead Road held a Hooded Warbler female, Chestnut-sided Warbler, Northern Waterthrush, Indigo and Painted Buntings, a singing Kentucky (unless someone was taping), Northern Parula, Common Yellowthroat, Orange-crowned and Tennessee Warblers, Black-and-white Warbler. Moderate activity. This was to become my go-to spot for Saturday and Sunday when the Convention Center had the event going on. The Convention Center event was setting up so I parked at the Monstrous Boondoggle (aka the SPI birding center) and hoofed it. This netted me a Vesper Sparrow along the entrance road. Fewer bird numbers than Thursday morning - no buntings, warbler numbers down (Blackburnian, Worm-eating the best) although decent numbers of both orioles. Sedge Wren was heard from the the front of the center (yesterday was at the rear). Fewer shorebirds and terns, also. New birds were: American Redstart and Great Kiskadee, two Peregrines flying over, and a northbound Merlin with full crop. At the Valley Fund lots/Sheepshead things were not hugely voluminous but interesting warblers: female Blackburnian, female Hooded, Yellow-throated seen briefly, male Cerulean. The Yellow-billed Cuckoo was the only identified one for the trip, although I had fleeting glimpses of two more on High Island later on. And that was it for South Padre Island for the day. Back to the Aplomado site, where the falcon was two pylons down in heat haze. It reacted to overflying Swainson's Hawk at one point - first time I've been certain I've seen one in the air. There was possibly a second one further east, but I did not pull over to check. Chihuahuan Ravens present once again. Two Horned Larks on the road were the first for the trip. At the marsh I pulled out the scope to parse the shorebirds more carefully: Least and Semipalmated Sandpipers, Stilt Sandpiper, Lesser Yellowlegs, Long-billed Dowitchers in molt but ID by call, American Golden-Plover, Roseate Spoonbill and other herons, Black-bellied Whistling-Duck, Gull-billed Tern, Northern Shoveler. Toward Laguna Atascosa via Laguna Vista - Northern Bobwhite, Lark Sparrow, Bronzed Cowbird, Couch's Kingbird, White-tailed Hawk near Cameron Co airport on the second attempt, Myiarchus sp. probably Ash-throated but ambiguous with Brown-crested under lighting/migration conditions. Green Jay and White-tipped Dove at the feeders. West to Estero Llano Grande State Park, which was moderately active with shorebirds but pretty light on passerines. Black-necked Stilt, Greater Yellowlegs, Blue-winged Teal, Fulvous Whistling Duck, Spotted Sandpiper on Ibis Pond from the deck. Walking around pond added Long-billed Dowitcher. Yellow-crowned Night-Heron and Green Kingfisher were in Grebe Marsh but I failed to see any Pauraques. Many Swainson's Hawks were migrating overhead. The boardwalk across the Dowitcher pond held true to its name with many Long-billed Dowitchers and Stilt Sandpipers in a wide range of pre-alternate molts as well as a few Least Sandpipers and Lesser Yellowlegs. 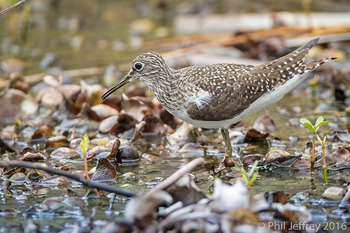 Stilt Sandpiper plumages varied from near-basic to almost full alternate. The Tropical Area was pretty somnulent: Long-billed Thrasher, Buff-bellied Hummingbird. Progreso sod farm, after a little backtracking when Google maps tried to direct me down the middle of a farm field: Upland and Buff-bellied Sandpipers, Pectoral Sandpiper, American Golden-Plovers, probably Baird's but too far in very bad light. Cattle Egret and a few Black-necked Stilt. There was one pipit way out in the grass that statistically was very likely to be Sprague's but given lighting conditions was well out of definitive ID range. (Sprague's but no Americans had been reported from there before and after my visit). Turns out that Anzalduas County Park closed at 5pm so that was it for this trip. Some unmarked car - like local law enforcement - was clearly wondering what I was doing and trailed me for a while. What I was doing was checking out the Swainson's Hawks that were settling into the fields. Bentsen State Park at 6pm just around the visitor center - Clay-colored Thrush singing across road, Curve-billed Thrasher, Buff-bellied Hummingbird. Towards dusk I went in search of the diminished Green Parakeet flock and found perhaps 20 of them at 10th/Trenton a few blocks north of their usual 10th/Dove location. Numbers were down from wintering flocks of a couple of hundred. Then there was a little odyssey with the hotel - they'd converted from an America's Best Value Inn to a Texas Inn but in the confirmation email three days previous it was given as the older name. Apple maps first sent me to a Motel 6 (arguably not the "best value" inn in the valley) but it was the name change that really messed with my head. Once resolved it was somewhat worn, light on facilities but comfortable enough for my purposes and had a guest laundry. I don't particularly recommend the Texas Inn in Pharr, however. There are better options in that price range including the oft-lamented Motel 6. Arriving at dawn at the boat ramp at Salineno it was fairly dark with low cloud. The river was only moderately active but after 2 hours or so most of the targets were seen: all 3 kingfishers; Altamira/Hooded/Audubon's Orioles; three distant Red-billed Pigeons; two singing White-collared Seedeaters. Brown-crested Flycatcher, Yellow-breasted Chat, Mexican ssp Mallard (white boundaries to speculum) were all good additions. Along the dump road - dry this time around - Curve-billed Thrasher, Northern Bobwhite and fields closer to Falcon that had singing Black-throated and Cassin's Sparrows. Otherwise not all that active. Falcon (Starr) County Park had Scissor-tailed Flycatchers coming through in numbers, two Bullock's Orioles, Cactus Wren, Lark Sparrow, Verdin, Vermilion Flycatcher but was not quite as birdy as in 2015 where it held a lot more sparrows. Two Bobwhite flushed from the grass near the entrance. Falcon State Park was a little slow: Greater Roadrunner with nestbuilding material, more Verdin, probable migrating Sharp-shinned Hawk, and the start of the day's Swainson's Hawk migration. I hustled back down-river to do more target birding. At Frontera word was in that there had not been Blue Bunting in two days, so I did a little coverage and found it somewhat slow. Might have heard singing Blue-headed Vireo but it was mostly the resident birds. At the feeders I saw the continuing Black-headed Grosbeak female then 15 minutes later the female Crimson-collared Grosbeak flew in towards the back of the feeding station, looked around for about a minute and then left. It's more of a leaf-eater than seed-eater so the feeding station wasn't where I was expecting to find it. Only other interesting bird was Ovenbird. A White Ibis joined the Black-bellied Whistling Ducks on the pond. Looping back toward South Padre I detoured via Sabal Palm Preserve mainly in search of Least Grebe. It was very quiet, and sadly the Great Horned Owl nest had apparently failed (snakes). On the pond - whose level was clearly low by historical standards - Ringed Kingfisher, Least Grebe, Solitary and Spotted Sandpipers. Buff-bellied Hummingbird, Bronzed Cowbird, Plain Chachalaca, White-tipped Dove at feeders. Not much evidence of a large migrant movement at in the afternoon at South Padre Island/Sheepshead but some decent warblers nevertheless: Kentucky, Wilson's, Worm-eating. Scissor-tailed Flycatcher at the base of the causeway was evidence of some migration. What was even more in evidence was a swarm of bikers, so I didn't even try the Convention Center. The day's finale was Red-crowned Parrot at Oliviera Park in Brownsville. The parrots turned up right around dusk. Red-crowned Parrot were present - these are the only countable ones - but also Red-lored Parrot (yellow on face) and White-fronted Parrot (red facial mask; white on forehead). These exotic two species had enough numbers that they could have longer-term prospects since they were only a little less numerous than Red-crowned. Additional species of parrot have also been reported from Oliviera. Two Nighthawk sp were hunting over the interstate at San Benito at dusk. I attempted a variant on the "Sparrow Road" theme based on a recent mini-trip report turned out to be partially a bust and also quite educational. Short version: stick to Jara Chinas but be circumspect. Wallace Road - I started northbound in heavy overcast at dawn and there was some agricultural traffic so it was not at all birdy due to both effects. Best birds: Crested Caracara, twittering Tropical Kingbird at one of the wetlands although most of the tyrants were Couch's, Blue Grosbeak towards the upper drier habitat, Swainson's Hawk and Scissor-tailed Flycatcher. Lark Sparrow were moderately common. East from Wallace along FM-490 I saw White-tailed Hawk and Northern Harrier then down North Bryan where a pond held Roseate Spoonbill and both white Egrets. On a cut-across road headed back to Wallace a small ranch held ornamental (Chinese-ish) geese and peacocks singing. Another house had chickens and a large pig feeding in the front yard. This road also had a couple of Dickcissel singing along the wires. Returning to FM-490 and traveling east through McCook, I turned down the unnamed farm road that I had traversed in previous years - essentially a north-south road, one block east of Jara Chinas after the latter dead-ends into Mile 14 Road. Horned Lark, Lark Sparrow, 3 Upland Sandpipers and more Scissor-tailed Flycatchers. A young White-tailed Hawk was out in the fields. Uplands are relatively large shorebirds but can be inconspicuous as I only found them when I stopped to look at Scissor-tailed Flycatchers. Reminiscent of how I found my life Uplands on the central TX coast in farm fields along the approach to Aransas NWR on one of my first TX trips. I cut west across the road south of the antenna ("the antenna" being a reference to how I discovered this sliver of productive farmland a few years ago) but the habitat here was uninteresting and mostly corn fields - Jackrabbit, Horned Lark. Headed south down Jara Chinas at a relatively late hour in better light and there were more birds but still mainly Lark Sparrows by numbers. I heard Verdin and Cassin's Sparrow with inevitably several more Scissor-tailed Flycatchers. The better array of native RGV habitat yielded Long-billed Thrasher, Greater Kiskadee, Swainson's Hawk. I'd pulled over to photograph an uncharacteristically cooperative Scissor-tailed Flycatcher and had a police office roll up behind me and light up. After a friendly conversation he advised that Jara Chinas was used by drug and illegal runners at high speed - can't say that I had particularly noticed dubious activity before, but circumspection is due. Especially since after reaching US-83 on the west end of La Joya several cop cars had stopped to pull over one or two other vehicles. With the cloud clearing a little, off to Bentsen State Park: Black Phoebe and Cave Swallow at the small bridge over the irrigation canal. It was quiet walking in with little birding beyond the very common valley birds. Ringed Kingfisher at the resaca. Pretty much nothing on the interior former camping loop that used to be very birdy at this time of year a decade ago - now there's nothing to lure the birds in. Bentsen stop feeding after the winter, so the feeders were empty. I started to see some hawk flight overhead and while reclined on a bench watched them move through breaks in the cloud. While there I heard Gray Hawk and Northern Beardless-Tyrannulet. Most hawk overflight was obscured by cloud so the ID was inferential (likelyhood + structure) but a few instances of identifiable Mississippi Kite and Broad-winged Hawk. In one instance an apparently migratory Harris's Hawk made me wonder if I was seeing Hook-billed Kite due to the broad wing profile but the plumage marks didn't fit. Back at the entrance gate a Brown-crested Flycatcher was hunting the mesquite. No sign of the Clay-colored Thrush near the visitor center but Curve-billed Thrasher was building a nest in the parking lot. With more sun, temperatures were climbing into the 90's. I lacked enthusiasm to hike around Santa Ana in 90 deg F and 90% humidity so I stuck to sod farm birding instead. Progreso sod farms had good numbers of shorebirds: Upland Sandpiper, Buff-breasted Sandpiper, Baird's Sandpiper, American Golden-Plover, no Pipits, probable Least Sandpiper, Blue-winged Teal and Black-necked Stilt at the back of the eastern field where it was flooded. Pairs of Mottled Ducks were in the fields. Bank and Barn Swallows overhead. Flooded fields to the east of Weaver Road along Hackberry had reduced numbers and some very skittish Pectoral-ish and Lesser Yellowlegs-ish shorebirds. The Swainson's Hawks overhead probably didn't help with that but they weren't happy to see me either. Weaver Road sod farms: many Buff-breasted Sandpipers, one Upland Sandpiper, a few American Golden-Plovers and a few Least-ish Sandpipers. Then, being lazy and more interested in staying in the car a/c than hiking I went back out to South Padre Island for the last part of the RGV section of the trip. I avoided the Convention Center where, although the number of bikers had plummeted, there were still parking restrictions. South Padre Island Sheepshead Bay lots: Painted Buntings, Summer Tanager, Black-and-White Warbler, Northern Watherthrush, Yellow-breasted Chat. A late day visit to the trails around the Laguna Atascosa visitor center was not productive for much, and certainly not Crimson-collared Grosbeak, so I packed it in for the day. Enterprise were lackadaisical upon car return to the airport and Southwest ran their flight 45 minutes late into a stormy Houston. I reached the hotel in Winnie at 11:45pm, very tired indeed. 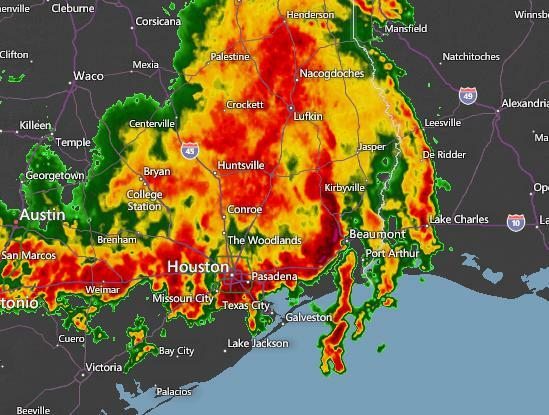 Overnight Sunday into Monday morning truly epic storms pummeled Houston which then flooded because of all that concrete reducing the environmental drainage. Things were better - if still rather hostile - out in the sticks (Winnie) where there's actual landscape to absorb more of the water. Yeah, that looks like a lot of fun. Winnie is south-west of Beaumont on this map, where the really exciting dark red coloration was at the time I captured this. Wikepedia calls this the April 2016 United States storm complex and it dropped up to 17 inches of rain in Houston. That seemed like a ton of rain at the time, but Hurricane Harvey topped it in devastating style in August-September 2017 with 43 inches in Houston and upwards of 50 inches east of Houston, including so much rain near Winnie that it turned I-10 into a swimming pool. Overnight there were lines of storms but it was worse, if anything, at dawn. A foray down TX-124 found significant surface water in Winnie so I tracked east instead to Port Arthur to see if I could get ahead of the worst of the storm - the road was closed into Louisiana but there were shorebirds in the partly flooded sections of Riverfront Park on the "Paradise Island" section of Port Arthur: peeps, Stilt Sandpiper, Spotted Sandpiper, Solitary Sandpiper, Willet, Black-necked Stilt, Black-bellied Whistling-Duck, Egrets and Herons (incl Yellow-crowned Night-Heron, Little Blue, Cattle, Snowy). It finally stopped raining around 2pm and road conditions rapidly improved as the overload of the local road drainage ceased and roads actually dried up pretty quickly. By the end of the day I was on the dirt roads of Anahuac NWR without any issues whatsoever. Out to High Island in search of migrants. Along the road at Boy Scout Woods it was quite birdy: many Scarlet and some Summer Tanagers, several Orioles (Orchard, Baltimore), Rose-breasted Grosbeaks. Small warblers were less evident: Blackburnian, Black-throated Green, Blue-winged, Black-and-white, Tennessee, (h) Ovenbird, Hooded. Several Cedar Waxwing flocks. In the very dark and quiet wet woods at Boy Scout: Veery, Swainson's, Wood, Gray-cheeked Thrushes, Eastern Wood-Pewee, Red-eyed and Yellow-throated Vireos, Ruby-throated Hummingbird, Painted Bunting male+female, a few Blue Grosbeak and Indigo Bunting. Somewhat of a drop-out but reports suggested that sites south of the storm line (Quintana etc) did rather better. Certainly it would be a brave passerine to fly into the teeth of that storm. One or two Merlins hunted the surrounding area looking for stragglers. Rollover Pass was super high tide again, doubtless skewed by all that run-off water: Sanderling and Ruddy Turnstone, Willet, American Avocet, many Royal and some Sandwich/Common Terns, Black Skimmer. No sign of Least and Black Terns. Royal Tern flocks were seen on the beaches east of Rollover and some shorebirds: Dunlin and (Short-billed?) Dowitchers feeding on local lawns. On toward Anahuac NWR where FM-1985 had Eastern Kingbirds, Blue Grosbeak + a few Indigo on wires along the road. A single Scissor-tailed Flycatcher. Some shorebird concentrations (mainly Yellowlegs) and some mixed flocks of egrets/herons/ibis: White-faced Ibis, many Cattle Egret, Great Egret, Snowy Egret, with other heron species in the air. One Common Nighthawk was on a fence post. At Anahuac NWR more Blue Grosbeaks and Orchard Orioles in the shrubs along the NWR drives but a Merlin was at the willows so no passerine was sticking its head up there. Fulvous Whisting-Ducks were in the air. Down toward the Yellow Rail prairie where Willet, Black-bellied Whistling-Duck, Blue-winged Teal were found. Sora and Clapper-ish Rails were swimming in the marsh - the Gulf coast Clappers are so dark I have hard time telling them from King unless I see them in good light, but it was certainly right next to the saltwater bay. What sounded like King Rails were vocalizing further toward HQ. Sedge Wren singing in various locations and I managed to briefly see a perched-up one before tracking down a singing male at the base of a small shrub. Two Northern Harriers. A slightly incongruous Whimbrel right next to two "Clapper" Rails. Seaside Sparrow in coastal grasses right at the bay were my first for Texas but actually fairly numerous in this habitat. A Common Nighthwak was hunting over the NWR entrance road on the way back to the hotel in Winnie. Rainy start again - this trip had heavy overcast or rain on 5 or 6 of 8 days. Stopped at south end of the High Island bridge over the shipping channel and accidentally flushed Sora (didn't fly far - enough to know it was Sora and not Yellow Rail), heard Marsh and Sedge Wrens, saw Indigo Buntings. The marsh adjacent to here looks like Yellow Rail prairie habitat. High Island starting at Hook Woods: Summer Tanager outside the gate, Kentucky Warbler inside it. Blue-winged Warbler male giving a very odd staccato song, Worm-eating Warbler, female Prothonotary Warbler, Chestnut-sided Warbler, more Indigo and two Painted Buntings, Magnolia Warbler, Hooded Warbler, White-eyed Vireo. Not super-active however, and things were damped down by intermittent rain. Boy Scout Woods along the road: Tennessee Warbler, Orchard Oriole, Scarlet Tanager, Indigo Bunting. Smith Oaks: Baltimore Oriole, Cedar Waxwing flocks, possibly heard Cuckoo - and another heavy rain shower. The radar looked like storms were making their way onto land at High Island, and the situation would be a little better at Port Arthur. Better weather indeed at Sabine Woods, although not a cloudless sky. Unfortunately a Least Bittern had met its end along the road. Cerulean Warbler, Golden-winged Warbler, Chestnut-sided Warbler, American Redstart, multiple Hooded Warblers, 2 Kentucky Warblers, 2 Worm-eating Warblers, Ovenbird, Northern Waterthrush, Ruby-crowned Kinglet, Downy Woodpecker, Golden-fronted Woodpecker, Blue Jay, Brown Thrasher. Eastern Wood-Pewee, Acadian-ish Empidonax sp. Great Crested Flycatcher. A single White-throated Sparrow at the drip but it's not like there was a shortage of environmental water given the recent storms. Brown Thrasher. The foursome of Veery/Swainson's/Wood/Gray-cheeked Thrushes. Multiple Summer and a few Scarlet Tanagers. Indigo Bunting and female Blue Grosbeak. Rose-breasted Grosbeak. Snake resembling Gulf Coast Ribbon Snake or a Texas Patchnose. Texas Point - Rose-breasted Grosbeak and Indigo Bunting at parking lot but really nothing else. Tyrrell Park in Beaumont in search of Red-headed Woodpecker. No Red-headed but Red-bellied Woodpecker, Red-shouldered Hawk, Red-tailed Hawk, Eastern Kingbird, Blue Jay. At the cattail marsh: Common Gallinule, American Coot, possible Purple Gallinule, Blue-winged and two Green-winged Teal, Black-necked Stilt, American Avocet, Yellowlegs sp, White Ibis and other herons. American (presumed) Crow over I-10 while returning to Winnie from Beaumont. Rollover: still high tide so skipped. Rettilon Road: Black-necked Stilt and Willet were along a partly-flooded Rettilon. It seemed to be relatively high tide with limited beach to drive along - I didn't make it all the way to the wooden pylons. However the beach was quite useful: Sanderling, Ruddy Turnstone, American Avocet, Semipalmated Plover, Snowy Plover, several Piping Plover, several Wilson's Plover, a few Black-bellied Plover. Royal, Sandwich, Least Terns, Black Skimmer and the 3 usual gulls including Herring. A Wilson's Phalarope flock dropped into bathe at the freshwater pool before heading out. Snowy and Tricolored Herons. It was somewhat sunny at Rettlon but headed back east along Bolivar peninsula the clouds reasserted themselves. At the close of the day - quite dark - at High Island: Kentucky and Prothonotary Warblers. Scarlet and Summer Tanagers, Rose-breasted Grosbeak, Swainson's Thrush, Ovenbird. Final day, starting at Sabine Woods - notably quieter than the previous day although it was both earlier and more overcast. Swarms of Barn Swallows were skimming over the road past Sabine Pass - the size of the flocks suggests that these were all migrants not least of all since they're not colonial nesters. Summer and Scarlet Tanagers, Easter Wood-Pewee and Great Crested Flycatcher, Hooded Warbler, Worm-eating Warbler, singing Black-and-White Warbler, Northern Waterthrush. At least two Sora were singing from marshes as was one large rail. A raptor(harrier?) put up huge numbers of Blue-winged Teal out of the marshes - literally hundreds. A brief stop at High Island - quiet along road at Boy Scout Woods (5th St) with Tennessee Warbler and Orchard Oriole. Tide was lower at Rollover but still not low, suggesting a relatively narrow window for the extended mudflats, or that hydrology has changed enough to mostly eliminate them. Least, Black, Sandwich, Common, Forsters and Royal Terns. Sanderling, Ruddy Turnstone, Short-billed Dowitcher, American Avocet, Willet, Black-bellied and Semipalmated Plovers. Fly-by flock of Wilson's Phalarope. Brown and American White Pelicans in Bay. It was at least somewhat sunny ahead of a long line of storms lurking n the distance as they made their way east from Houston. Back at High Island, Smith oaks was slow in passerines (Red-eyed Vireo and female Hooded Warbler) but had an active rookery which appeared to be Great Egret, Snowy Egret, Roseate Spoonbill and Neotropic Cormorant. Alligators lurked below for any nestling that lost its footing. No sign of the target Anhinga. Tragically, another road-kill Least Bittern was seen on the side of TX-124. 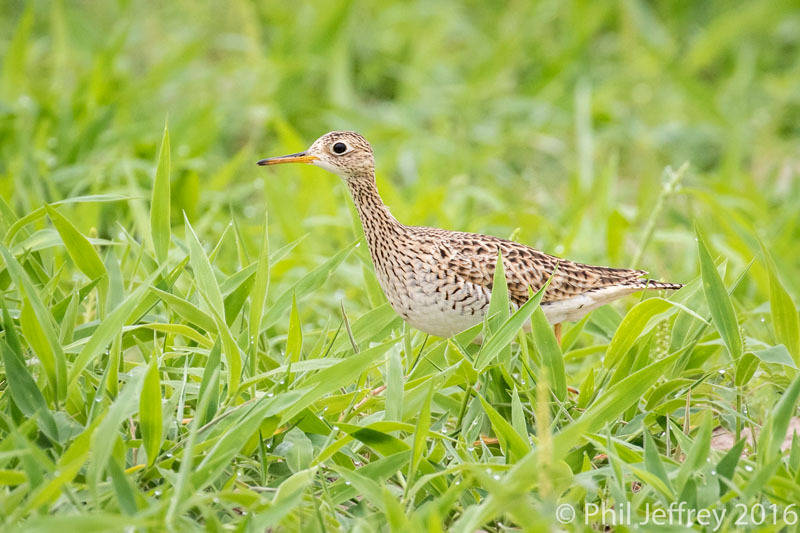 Penultimate stop was the formerly flooded rice fields of French Road off TX-124 which had Whimbrel, Long-billed Dowitchers in greater extent of breeding plumage than I'd seen all trip, two Black-necked Stilt and two Killdeer. There was still some water in the fields but apparently fewer prey items to lure in shorebirds. Off to Winnie in the first of the line of storms and the start of the repacking, then onto Trinity River where the Wallisvillle Lake project yielded Great Blue Heron, Great Egret, Roseate Spoonbill and two Anhinga, the final trip bird. Sedge Wrens were singing from the scrubbier wet areas. Somewhat galling to be sitting in the airport under bright sunshine after the storm line had passed when most of the trip was shrouded in overcast. Southwest departed the first leg of my flight - to St Louis - 20 mins late but I had a 90 minute gap between flights at STL so it didn't matter. The second leg also looked like it was going to be late but a rapid boarding process allowed the plane to leave on time and even arrive a little early, followed by a baggage claim process that was extremely efficient. So they somewhat salvaged the 3 mediocre previous flight legs by doing a good job on the last one. Direct flights are 4 hours. The indirect ones were fewer $$$ but elapsed time was 6-7 hours. 242 species, compared to 229 in 2015 and 236 for my CO-NM-TX trip in 2014. 242 seems to be a new single state trip record - odd in that it really didn't feel like I netted more species. Shifting the trip 5 days later made it more difficult to find Swainson's Warbler (none) and Prothonotary Warbler (1 or 2) but added new birds like Magnolia Warbler based on a later migration schedule. 25 warbler species. Combined with Palm/Pine/Yellow/Black-throated Blue in Central Park the subsequent weekend (23rd, 26th) and Louisiana Waterthrush before leaving for TX, I netted 30 warblers in April, mainly as a consequence of this trip. Update: very rare Swainson's Warbler on 4/28 was actually #31 for a presumably unassailable personal best for April. Multi-state trips are 244 (AZ-NM-CO 2006) and 251 (AZ-NM-CO 2018) so by any reckoning 242 is a good total. All text and pictures ©Phil Jeffrey 2016. All rights reserved.